CAIRO, Egypt, August 24, 2015 (ENS) – Through Egypt’s new national vehicle scrapping and recycling program, older taxis are being replaced by newer vehicles to increase fuel efficiency, reduce air pollution and protect the climate. The Egyptian public transport fleet is aging; the average taxi in Egypt had, until recently, been on the road for 32 years. Aging fleets are prone to frequent breakdowns and high emissions, because older vehicles are typically not equipped with modern catalytic converters. The vehicle scrapping and recycling program enables owners of taxis, buses, microbuses, and trailer trucks to voluntarily surrender their vehicles for managed scrapping and recycling in exchange for financial incentives toward the purchase of new vehicles. 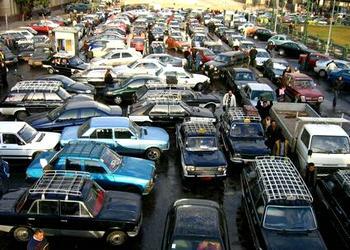 The scrapping and recycling program is currently limited to taxis in the Greater Cairo Region, but may later expand to other regions and vehicle types. The eligible vehicles are those covered by Traffic Law #121, enacted in 2008. This law states that owners of mass transport vehicles more than 20 years old are not eligible for new operating licenses or license renewals. The law was designed to accelerate fleet replacement to improve air quality, reduce greenhouse gas emissions, and reduce the number of traffic accidents involving older vehicles. Because Traffic Law #121 does not specify how eligible vehicles are to be disposed of, owners can choose to sell their vehicles in regions where the law does not apply. They can convert their vehicles to private use because private vehicles are not affected by the law, or they can dismantle the old vehicles and sell the engines for use in other vehicles. Officials say that without a scrapping and recycling program, Traffic Law #121 would not have its intended impact on safety, air quality, and greenhouse gas mitigation. The results of the program to date are encouraging. In Cairo alone, a total of 40,689 new taxis have replaced aging taxis, some of which were over 50 years old. The government calculates that the equivalent of over 130,000 tons of carbon dioxide were avoided in 2013 and 2014 due to the program. The new taxi fleet reduces emissions of airborne pollutants such as carbon monoxide and nitrogen oxides, and contributes to increased traffic safety across Egypt.